The three vessels of the UK’s Magna Carta Steamship Company form a rather unusual crusing fleet, with the Spirit of Chartwell and Passepartout cruising the upper and lower reaches of the Thames and the Lord of the Glens the Caledonian Canal in Scotland. The 36-berth Spirit of Chartwell and 54-berth Lord of the Glens accept overnight passengers, with the latter having more recently been in the news as she has been chosen to act as the Royal Barge for this year’s Thames Diamond Jubilee Pageant in early June. As part of a flotilla of close to 1,000 vessels, she will celebrate sixty years of the reign of Queen Elizabeth II by carrying the monarch herself. Elsewhere, TUI-owned Quark Expeditions has added two new ships to its expedition cruise fleet with the 114-berth Sea Spirit, ex-Spirit of Oceanus, and the 189-berth Ocean Diamond, ex-Le Diamant. And finally, for those wishing to travel by cargo ship, Germany’s NSB has opened up two new cargo-passenger routes, between Asia and Australia and between Europe and Canada. The 486-ton Spirit of Chartwell is a small cruise ship on the Thames that is equipped with eighteen luxury overnight cabins and of which not too many have heard as yet. Built in 2010, this 217-foot luxury cruiser has been designed in the mode of the old railway Pullman carriages popular in the 1920s, a kind of “Orient Express” on the Thames that even features some items from that famous train. Cruising the Thames by day, she remains at Canary Wharf’s West India Dock for dinner and also provides overnight acconmodation for those wishing to stay on board. 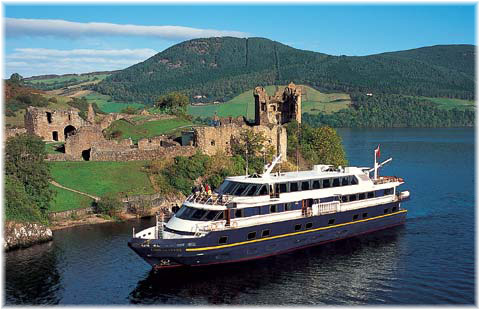 The Spirit of Chartwell’s owner is the Magna Carta Steamship Company, which also owns the Lord of the Glens, cruising in Scotland. The décor on Spirit of Chartwell includes artefacts from the Lalique-designed Orient Express dining car “Côte d’Azur,” highlight of which is a series of exquisite glass panels of classical figures, together with thirty-three original armchairs that have been painstakingly restored. In addition, she displays fittings from the ocean liners France, including wall lights in most of the cabins, and Windsor Castle, from which have come two magnificent portholes in the main lounge, bathroom fittings, bar stools and a fine clock. Above this, Spirit of Chartwell’s observation deck offers alfresco dining and the ideal vantage point from which to view the passing scenery, with her opulent lounge bar providing a sheltered and tranquil retreat from English weather. The big news broke just before Christmas when Spirit of Chartwell was chosen to be the Royal Barge for the Thames Diamond Jubilee Pageant, carrying Her Majesty Queen Elizabeth II down the Thames in celebration of sixty-years on the throne. The pageant, to take place on Sunday, June 3, will see almost 1,000 vessels of different kinds either travelling the Thames or greeting the flotilla as it makes it way downstream. Up to 30,000 flag-waving members of the public are expected to be on board the various passenger-carrying vessels. Accommodating the Queen, the Duke of Edinburgh and other members of the Royal Family, Spirit of Chartwell will be the centrepiece of the pageant, decorated and adorned for the occasion at the head of the royal section of the flotilla. The Prince of Wales will play a key role as Patron of the Pageant. The Spirit’s owner, Philip Morrell, who founded Voyages Jules Verne in 1982 and sold that firm to Kuoni in 1998, has donated the use of Spirit of Chartwell to the Queen for the pageant, after which she will return to cruising the Thames. Spirit of Chartwell’s usual voyage, called Memories of London, starts at Canary Wharf, sails downstream towards the Thames Barrier then upstream past London’s iconic landmarks and the Houses of Parliament before returning to Canary Wharf. 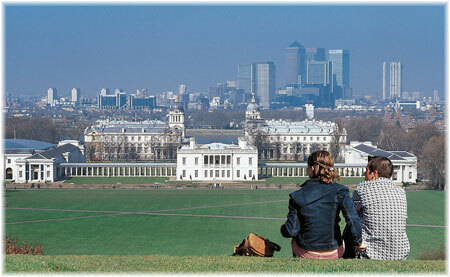 Calls are made at Greenwich and Tate Britain and an overnight stay is offered in stateroom accommodation. For this voyage, guests embark at noon at Canary Wharf, where there is parking available, and either disembark at 9:30 pm after dinner or remain on board overnight in a stateroom. This celebratory package includes champagne reception, three-course luncheon, afternoon tea and five-course gala dinner, and is priced from £195 per person in groups of six or £265 per person as a couple. The overnight stay on board is additional at £75 per person. A further optional excursion from Windsor to Cliveden is available for £95 per person. For passengers boarding or disembarking from cruise ships at ports in the south of England, a special 2- or 3-night package will soon be available as a pre- or post-cruise visit to London’s River Thames. Including both the Spirit of Chartwell and her smaller fleetmate Passepartout, this package will cover both the lower and upper reaches of the Thames. 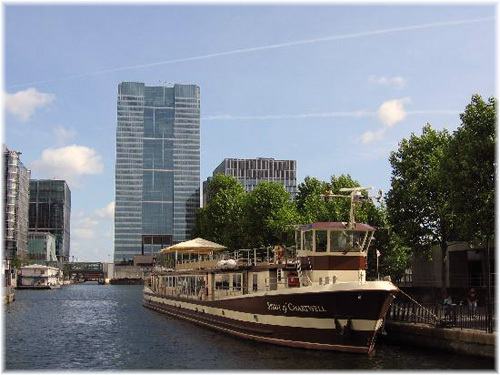 Travellers will embark Spirit of Chartwell at Canary Wharf in the late afternoon, with the evening reserved for independent exploration of London or the theatre before retiring to the vessel at her overnight moorings. Rising in the morning for breakfast among the gleaming towers of the new era, guests will later join the Captain for a champagne reception before sailing downstream towards the Thames Barrier. Lunch will be served while sailing upstream to Greenwich, the first call. There will be time to explore Greenwich’s Maritime Museum, the Observatory, the Cutty Sark and the village itself before setting off upstream again, passing the famous Prospect of Whitby pub, the wharves at Wapping, Tower Bridge, the Tower of London, St Paul’s Cathedral, Shakespeare’s Globe Theatre, the Millennium Wheel, the Houses of Parliament and Lambeth Palace. Afternoon tea will be served before reaching Millbank, for the Tate Britain Gallery and Westminster Abbey. A gala dinner will then be served in the George Bradshaw Lounge, during which the voyage will conclude with a pass under London’s impressive bridges, to re-enter West India Dock for another overnight stay. On the third day, after breakfast, guests will disembark from Spirit of Chartwell and travel by limousine to Windsor for an exploration of the town and castle before continuing on to the Thames-side Oakley Court Hotel. From that hotel’s quay, guests will embark on the 75-foot Passepartout, a vessel that resembles an Amsterdam canal cruiser with very large scenic windows, at both sides and overhead, travelling upstream from Windsor to Maidenhead and Bray, and reaching Cliveden Reaches, with its impressive river view up to Cliveden House. Set in 375 acres of grounds, Cliveden House, once home of the Astors, has hosted every British monarch since George I as well as Charlie Chaplin, Winston Churchill, Harold Macmillan, President Roosevelt and George Bernard Shaw, among many others. From Cliveden, the Passepartout will return to Windsor in the early evening, for a shoreside sojourn at the delightful Oakley Court Hotel, set of many films, that overlooks a pastoral river scene full of graceful swans, all of which are the property of the Queen. 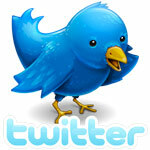 Lunch will be served on board and the overnight stay at the Oakley Court Hotel will be optional. Meanwhile, north of the border, in Scotland, Magna Carta’s third vessel, the 729-ton Lord of the Glens, is another vessel with the appeal of a luxury yacht, with all-round teak-clad viewing and promenade decks and rich mahogany interiors. She features twenty-seven luxury staterooms to accommodate 54 guests, a bar, lounge and a restaurant that accommodates all passengers in one sitting. The 150-foot Lord of the Glens can navigate both the Caledonian Canal that crosses Scotland and the open sea, and was designed to meet exacting criteria in terms of her dimensions and to satisfy the stringent safety requirements of the UK Marine authorities. 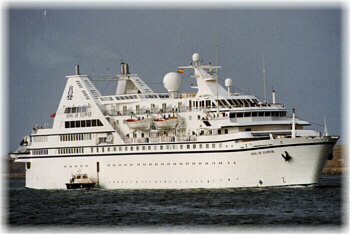 To this end, Spanish craftsmen rebuilt the vessel in 2000 using the finest materials and equipment. The Lord of the Glens’ spring and autumn seasons offer 5-night sheltered water cruising through the Scottish Highlands from £744 per person, while summer offerings include 7-night cruises from Inverness to the Kyle of Lochalsh from £1,481, and 10-night cruises from the Kyle of Lochalsh to Inverness from £1,994 per person. 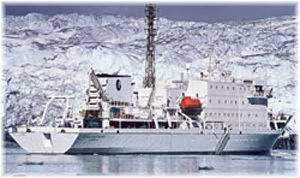 In her first season with Quark, 2012-13, which stretches from November through March, the Ocean Diamond will perform two 19-night cruises to Antarctica, the Falklands and South Georgia, from $9,695 per person on November 3 or $12,795 on December 26, and eight departures to the Antarctic Peninsula, from $4,295 for 9 nights or $4,795 for 11 nights. Two new cargo-passenger routes have recently been announced from Niederelbe Schifffahrtsgesellschaft Buxtehude (NSB) by its passenger office in Bremen. The first is from Hong Kong to Australia and the other between the Mediterranean and Montreal. The 53,700 deadweight ton container ship NYK Galaxy has now entered service between Hong Kong and Kaohsiung and Melbourne, Sydney and Brisbane, with a return by way of Yokohama, Osaka, Pusan, Shanghai and Yantian to Hong Kong. For those travelling from Europe, it is therefore now possible to sail all the way to Australia, albeit by changing ships at Hong Kong. 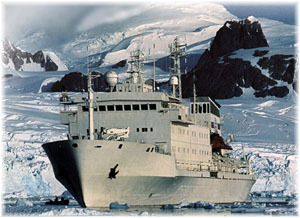 This voyage can also be booked as a 42-day round trip freighter cruise of Australia and the Far East. 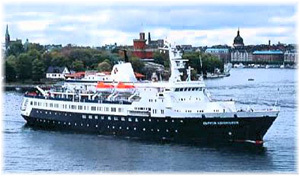 The NYK Galaxy carries a maximum of seven passengers in an Owners cabin, two double cabins and a single cabin. Fares are €85 per day for the single cabin or per person per day for the doubles and €95 per person per day for the Owners cabin, while sole occupancy of a double is €110 per day and the Owners €110 per day. Port charges are extra at €85 and deviation insurance is €105 for voyages up to 15 days and €160 for longer trips. The vessel is equipped with an indoor pool and fitness room as well as lounge and video/television room. Meals are taken with the officers. While NSB offers cargo-passenger voyages on a fleet of forty container ships on routes worldwide, NYK Line, charterers of the NYK Galaxy, in addition to cargo services offers cruises worldwide in Crystal Cruises’ Crystal Serenity and Crystal Symphony and its own Asuka II, formerly Crystal Harmony. Meanwhile, for travellers crossing the Atlantic, a lack of passenger service between Europe and Canada has meant that passengers have had to travel via US ports for the past cpuple of year. But starting in April space will now be available for eight passengers on the 45,625 deadweight ton Hanjin Palermo. The Hanjin Palermo departs Algeciras April 1 and Lisbon April 2 on her first Canadian voyage, due at Montreal on April 10. Returning, she leaves Montreal on April 13 for Algeciras, Valencia, Cagliari, Salerno, Livorno and Genoa, where she arrives May 1, before returning via Fos-sur-Mer, Algeciras and Lisbon to Montreal. Montreal to Genoa is an 18-day voyage, while her May 2 departure from Genoa will see her back in Montreal on May 15, for a crossing time of 13 days. Subject to space being available, the full 35-day round voyage can also be booked as a ten-port Mediterranean and Transatlantic cruise from any of the ports of call. 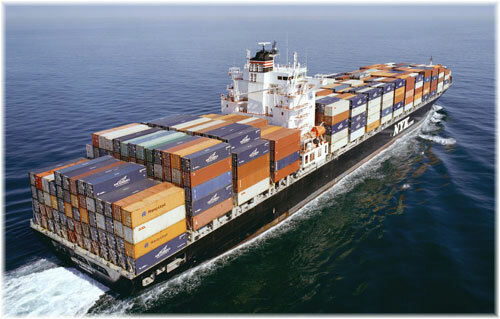 The Hanjin Palermo can accommodate up to eight passengers in an Owners cabin, two double cabins and two single cabins. Fares are €80 per day for the singles, €90 per person per day for the doubles and €95 per person per day for the Owners cabin, while sole occupancy of a double is €100 per day and the Owners €105 per day. Port charges are extra at €85 and deviation insurance is €105 for voyages up to 15 days and €160 for longer trips. This vessel is also equipped with an indoor pool and fitness room as well as lounge and video/television room. Meals are taken with the officers.